No finished item for you today -I’ve actually been quite productive with my sewing recently and I have a backlog of things to show you all, but the weather is so dark and miserable that I’m having a hard time managing to get photos of them! I’m quite pleased with my recent productivity though – for the first time, I’ve managed to actually get some decent sewing done when I’ve only had smaller blocks of time. I always mean to, but I find it hard when I only have an hour or two, but the last week or so I have managed to make use of the shorter periods of time I’ve had, and not needed at least one longer spell of sewing to get things done, so I’m hoping I can keep that up! So what I do have for you today is a few pics from the meet up in Goldhawk Road on Saturday, in honour of Lauren being over here. Unfortunately I don’t have as many pics as I should have had as I accidentally wiped my memory card after taking a few! Oops! 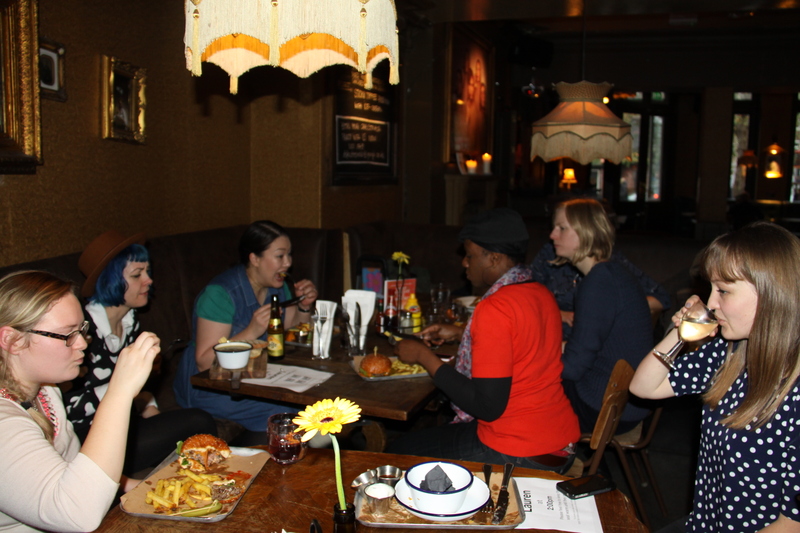 I had an awesome weekend this weekend – the meet up on Saturday was wonderful, it made me so happy! I love hanging out with sewing people – everyone is so nice, and it’s always nice to meet new people. 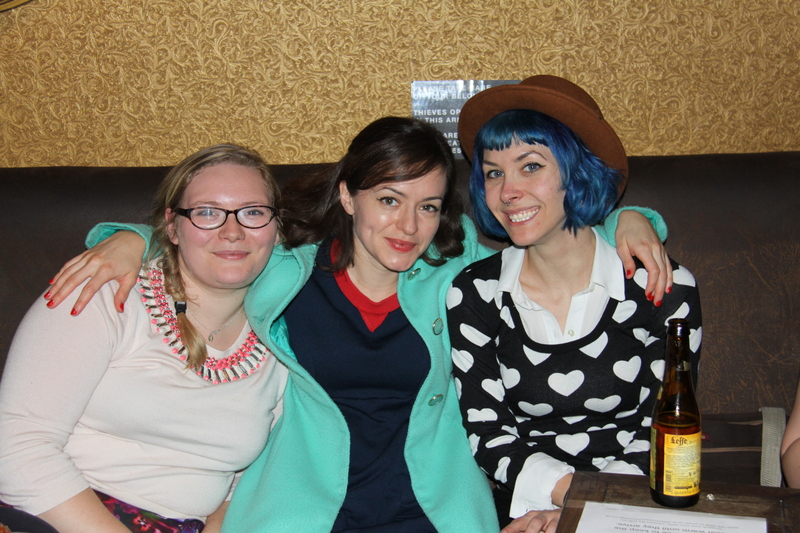 I really enjoyed Rachel’s NYLon meetup in May, but with about 80 of us, it was a little overwhelming and I didn’t get the chance to talk to everyone. There were about 15-20 of us this time, which meant that we could still go round the shops as a group, and we all got a chance to chat to everyone. 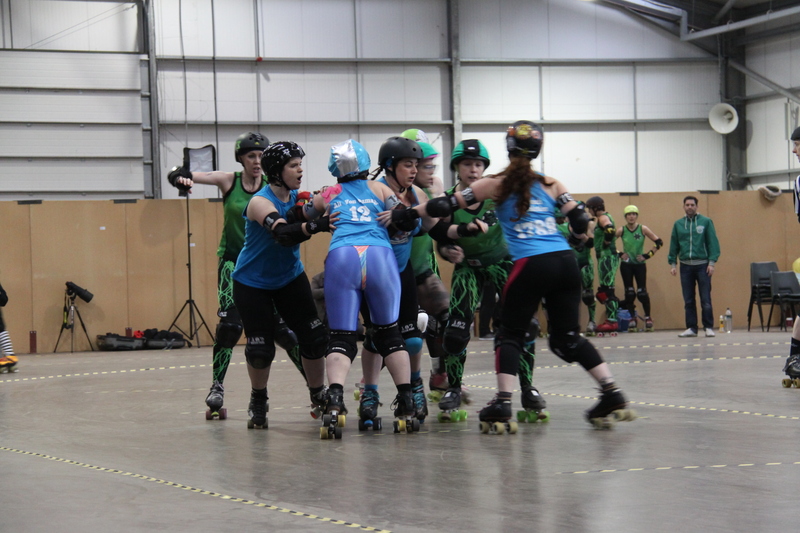 Straight after the meet up, I got the train up to Lincoln to watch my roller derby team play on Sunday, and as I was sitting on the train, I actually felt like I was going to burst with happiness after such an awesome day – that is what hanging out with sewing people does to me! The bout my roller derby team were playing was in the finals of a tournament that has been running this year. The first game they played was against our sister league, Big Bucks High Rollers, who we are good friends with and train with quite a bit, so it was always going to be an interesting game. It turned out to be probably the most tense game of anything I have ever watched – the lead kept switching all the way through, but when we were 18 points up going into the last jam, we thought we had it…until our jammer got sent to the penalty box and the other team managed to score enough points to beat us by three points! It was so stressful, and I was only watching! But I’m so proud of all my team mates for playing such a great game, and we then went on to cheer on Big Bucks for the rest of the day :) Here is a photo of them being awesome. You will have to excuse the slightly dubious fashion choice of shiny blue leggings and a multi-coloured thong…I really do need to get on and make team leggings! Those awesome green and black lightening blot ones that Big Bucks are sporting are made by a member of their team. Here’s a list of people who attended the meet up, along with their blogs. Thanks to Grazia for being proactive on the day and putting the list together! I know there are a few people missing from it who’s names I can’t remember, so if you were there and you’re missing from the list, please let me know and I’ll add you in! Not sure if Janet has a blog? I’m missing the three lovely ladies in the right of the group photo at the top of the page. I did spend quite a while admiring the Minoru of one of them, but rather ashamedly can’t remember her name! Once I find out, I’ll add them in to the list. Just the lady in red missing now, and someone else who was wearing a lovely red Minoru, but didn’t make it to the pub. Talking of Minorus, I saw not one but four gorgeous Minorus in person on Saturday, and it’s spurred me to hurry up and make mine. I made a toile for it the other weekend, but couldn’t actually decide if the size was right of if I needed to make the next size up. I think I probably need to go up, and I couldn’t bring myself to trace the pattern again, so it got put on hold! I was hoping to get it done in time for going to Paris this week (eeeee! ), but decided that I could either make one coat, or a few other things that I wanted to make, so I went for the few other things. Minoru is high on my list to get back to though. Talking of Paris – I’M GOING TO PARIS TOMORROW!! I am so excited! I’ve never been to Paris before, so I’m really looking forward to it, and it’s going to be especially great being there with sewing people (see my notes about awesomeness and happy feelings above!). After a couple of days hanging out with sewing folk, Marcus is then coming out on Friday evening to join me and we’re going to spend the weekend out there. If anyone has any recommendations for must-see things in Paris, please do let me know! 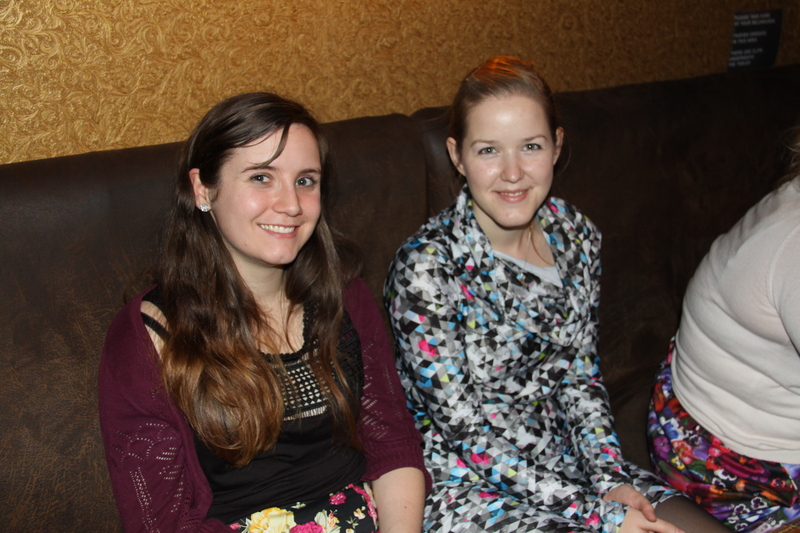 On Saturday I headed to Birmingham to join in with the SewBrum meet up, organised by Charlotte of English Girl at Home. I am always up for any opportunity to hang out with other sewing people, and I’d also never been fabric shopping in Birmingham, so it was a good opportunity to explore. As I have a few sewing meet ups/fabric shopping trips coming up, I went with a strict shopping list. I was successful in finding some things I was looking for, but unfortunately failed to find the two things I really wanted. The day didn’t get off to a great start when I left my shopping list at home, and managed to fail to charge my phone the night before, but luckily everything improved from there! Although the lack of phone battery means a lack of pics for this post unfortunately! I drove up with my friend Clare, and we headed straight to Barry’s, which was very quiet and calm when we arrived – the calm before the storm of 50 odd sewists who arrived 15 minutes later! I was a little bit overwhelmed by Barry’s – it’s certainly one of the biggest fabric shops I’ve been into. I didn’t even look at half the shop (probably for the best!). The key things I was looking for were some suitable fabric for a Robson coat. I did buy some royal blue twill at the meet up in London in May, but I’ve now decided that I want that make that into a Minoru rather than a Robson, so I’m still on the lookout for my perfect Robson fabric. I was also on the hunt for some awesome funky lycra to make roller derby leggings. So this is where I started my hunt in Barry’s. Unfortunately I didn’t find what I was looking for for those (there was some pretty cool lycra, but it was £15/m…), but I did find some awesome treasures. My most surprising find was this gorgeous sueded stretch satin. I found the navy bolt lying on a cutting table (lucky find!) and immediately asked the shop assistant to show me where it was from so I could check out the other colours. It’s beautifully soft, and I’m always on the lookout for nice stretch wovens. I bought 3m of Navy, which I think would make a classy Georgia dress (I decided, if the fabric is a reasonable price, 3m is my standard, as it allows enough for whatever I want to make). So I also bought 3m in the beige, which, along with some similar coloured crepe de chine as lining, I think will make a great pencil skirt. I also picked up some chambray, which is something else that had been on my list, and is destined to become a shirtdress of some description. We then headed, in dribs and drabs, to the Fancy Silk Store. As we walked in, I saw some gorgeous stretch cottons by the door, which I drooled over slightly. At £9/m, they were slightly more than I usually pay for fabric, unless it’s something I’m specifically looking for. So I walked away and pondered them for a while. I found a couple of jerseys in fancy silks which I was taken by – this gorgeous purple that I have lined up for a Lola (if I have enough, it was the end of the bolt), and this cool star print jersey, which I think might become a Renfrew. Jerseys are something that I find particularly hard to purchase online, as they are so variable in quality, so I took the chance to buy them while I was there. Clare and I then wandered round the rag market, but I didn’t pick up anything there (except for some very tasty figs, and some fleece lined tights, which I’ve been grateful for this week!). We then headed over to Guthri & Ghani, where Lauren had very kindly opened up the upstairs studio for us all to use. She also gave us a 10% off voucher, so we had a little wander round the shop downstairs. Everyone was eyeing up the gorgeous John Kaldor spotty chambray (the same one Tilly used to make her gorgeous Bruyere). I think everyone wanted it, but there was only 1.2m left on the bolt, so no one knew what to do with it. I’m pretty sure if they’d had more, they could have sold it many times over! I then spotted someone who had got her hands on the same fabric in burgundy, and it was stunning! According to the label, there was only 2.3m left on that bolt, so I didn’t think there’d be anything left after she’d had some. But after she’d had 2m cut, it turns out there was still about 1.28m left. I ummed and ahhed over that for a good few minutes before deciding that I would go for it! 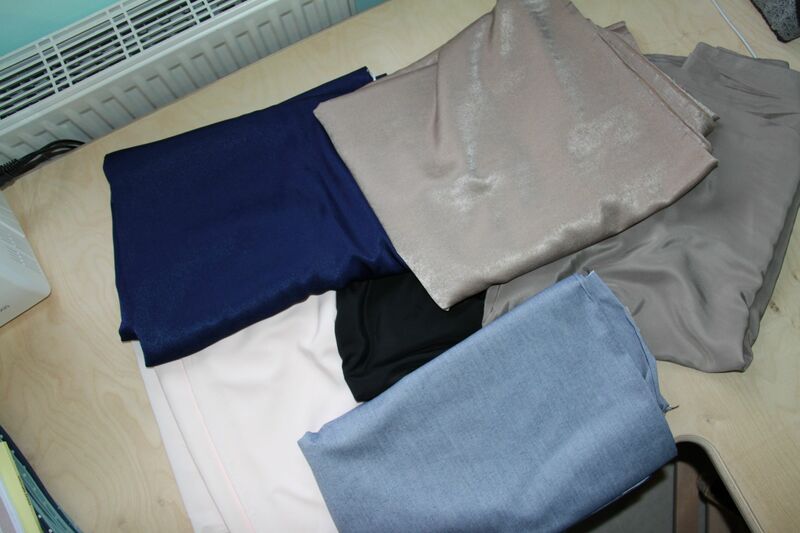 Again, it was more expensive than fabric I usually buy, but it is SO soft and wonderful! There’s enough to make a blouse/shirt out of. Having looked since, I haven’t seen the burgundy version online anywhere, so I’m glad I went for it! I was silly and forgot to take a photo of it when I was taking pics this morning, I’ll add one later! We then headed back upstairs, perused the table of raffle prizes for the raffle that had been organised, and generally milled around chatting to people. It was lovely to see again people who I’ve met before, and also meet new people. I’ve found myself a few new blogs to follow, which is great – I recently cleared my blogroll out as I just had too many, and never managed to read them all, but I now find that I don’t have enough to read, so a top up was good! The raffle was then drawn and I was lucky enough to win a subscription to Love sewing magazine, which I am pretty chuffed with. I like reading sewing magazines, but I rarely buy them now, as I often find them a bit expensive for what they are (and would rather spend the money on fabric or patterns! ), so it was the perfect prize for me, as it’s something I will enjoy, but wouldn’t have bought for myself. Post the raffle, we had a fabric and pattern swap. I’ve never taken part in one before, and it was quite a sight to behold. 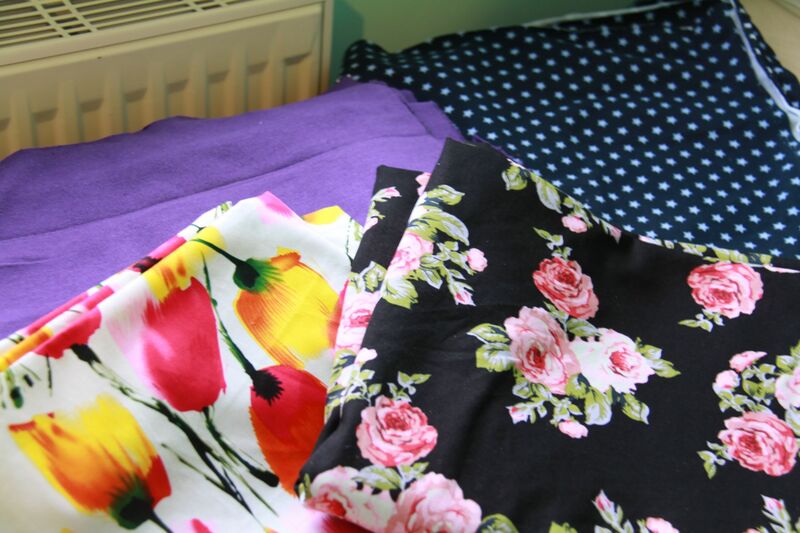 I managed to get myself a few pieces of lovely fabric. The green and white piece is from Jo-Ann’s (well travelled fabric!) and is a perfect match to the colours in my sewing room, so I’m going to use it to make some things for the room. The stripey piece may well become a Renfrew or similar, and I’m undecided on the others so far. Thank you to whoever brought these pieces along! I (and Clare) thoroughly enjoyed the day, and it was great to finally check out the fabric shops in Birmingham and visit Guthri & Ghani. 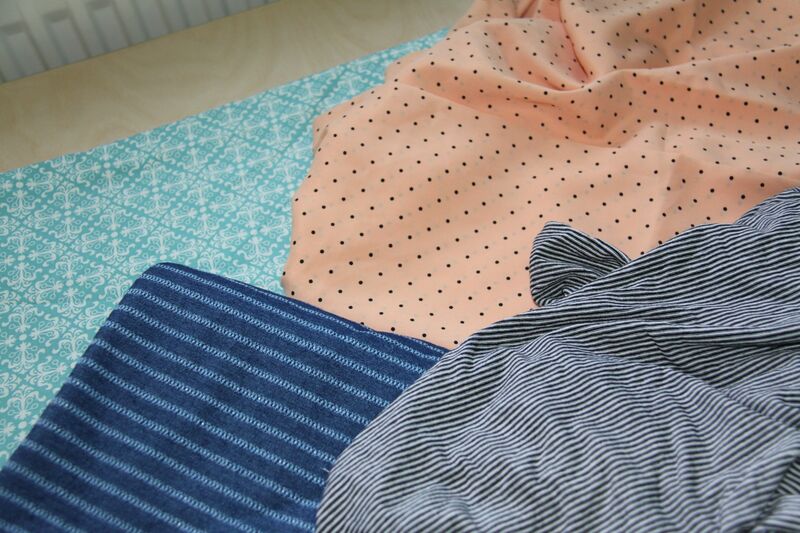 Now I just need to find some time to sew all the things I have planned with my new fabric! 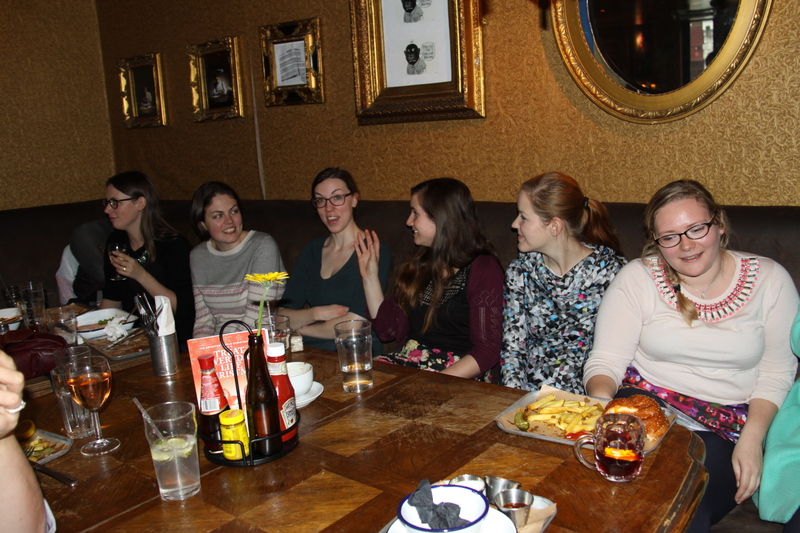 Thanks again to Charlotte for organising the meet up, and to Lauren for hosting us all!